Designed to challenge students’ ability to reason and work creatively with limited resources, a team of UTAR students from the Faculty of Accountancy and Management (FAM) impressed the juries with their tax knowledge and emerged as the first runner-up in the team category and second runner-up in the individual category at the finals of Deloitte Tax Challenge (DTC) 2017 held on 1 November 2017 at the Deloitte office in Kuala Lumpur. Team “The Survivors”, comprising four Bachelor of Accounting (Hons) final year students Kong Ying Jo, Lim Tze Shuang, Ong Yue Hian and Soon Yan Wen, was rewarded with a cash prize worth RM4,000 and a trophy. The team was also named the “Best Writer” which brought them another trophy and books sponsored by Wolter Kluwer. Meanwhile, in the individual category, a Bachelor of Accounting (Hons) final year student Ivan Tay Khai Zhang emerged as the second runner-up in the contest. As the second runner-up in the individual category, Tay won cash worth RM1,000 and books sponsored by Wolter Kluwer. The Deloitte Tax Challenge 2017 was aimed at cultivating and enriching the next generation of tax professionals in the region. The competition provided the contestants with a higher international benchmark with more regional exposure and enabled them to better embrace the challenges and opportunities brought by the ASEAN Economic Community when they join the workforce of a knowledge-based economy. 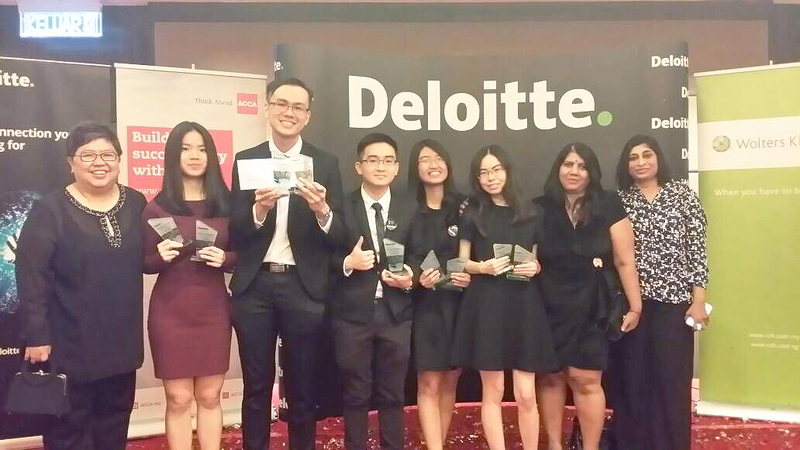 The competition also helped elevate the appreciation of the tax profession among current students while promoting Deloitte as an employer of choice. Designed to encourage and develop students from higher learning institutions to hone their tax knowledge, this year the annual tax-based competition saw 16 challengers from the individual category and seven teams of four participants each from the team category went all out to clinch the top spots in DTC. The participants had to undergo intense presentation training facilitated by presenters from the Association of Chartered Certified Accountants (ACCA), BFM89.9 and Deloitte before the finals. The participants had to analyse a two-part case study and present their solutions within a 20-minute presentation, after a two-and-a-half-hour preparation. The team category challenged the team’s powers of reasoning and working creatively with limited resources. The teams experienced real business challenges such as acquisitions, mergers, divestments, restructuring, GST and more. Meanwhile, the individual category challenged those who are bold enough to take on this challenge single-handedly. The category has its own business simulation tests aimed to challenge the tax knowledge. This year, the DTC received more than 3,214 participants from 50 universities and colleges, both local and international across. Apart from securing a job placement at Deloitte Malaysia, winners of the DTC will move on to the next level of this competition to Southeast Asia Deloitte Tax Challenge in Jakarta, Indonesia. The event is scheduled to take place next year. Representing UTAR at the DTC Gala Dinner were FAM Dean Dr Sia Bee Chuan, Department of Accountancy Head Shamini Kandasamy and FAM lecturer Shubatra Shanmugaretnam.